The Venice Sleigh Bed is our newest addition to our Renaissance Collection. It is indeed a true sleigh with curved oak headboard and footboard and features the same intricate hand carving that make this collection so unique. It is shown with 9 drawer Dresser, 3 drawer Nightstand, Trifold Mirror and TV Armoire. 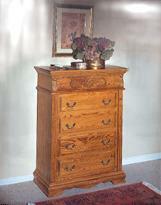 The, 5 Drawer Chest shown below.